Shortly after they appeared at this year’s Spirit of Mother Jones Festival in Cork, representatives of Yorkshire mining communities including Anne Scargill and Betty Cook of Women Against Pit Closures paid a courtesy visit to Liberty Hall, Dublin, national headquarters of the country’s largest trade union, SIPTU. There they were received by SIPTU’s General President Jack O’Connor. SIPTU were also generous part sponsors of the Spirit of Mother Jones Festival. 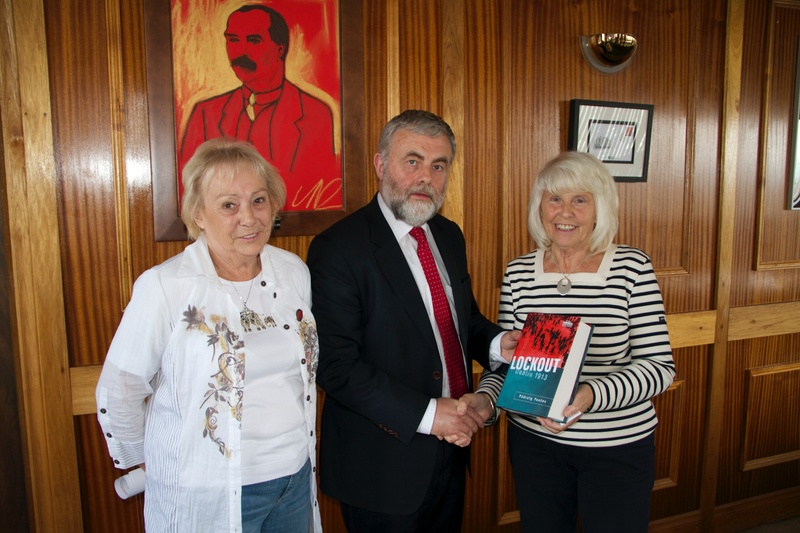 Anne Scargill (right) and Betty Cook of Women Against Pit Closures being presented with a copy of Padraig Yeates’ book on the 1913 Dublin Lockout by SIPTU President Jack O’Connor. Photo: Jimmy Thomson.